Heat the oven to 400°F. Bake the pastry shells according to the package directions. Remove the pastry shells from the oven. Press the candies down into the centers of the hot pastry cups. Let stand for 5 minutes. Sprinkle with the salt. Flavor Variation: You can also use other small candies in this recipe. Try miniature peanut butter cups, candy bar "bites" or teardrop-shaped chocolate candies (with or without almonds). Always bake Puff Pastry Cups in a preheated 400° F oven. Do not bake Cups in a microwave or a toaster oven. 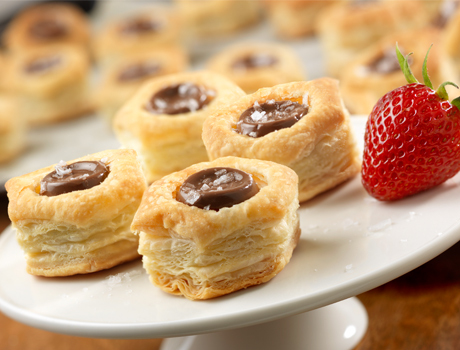 Place Puff Pastry Cups on ungreased baking sheets with “top” facing up. Place Cups about 2 inches apart on baking sheet. 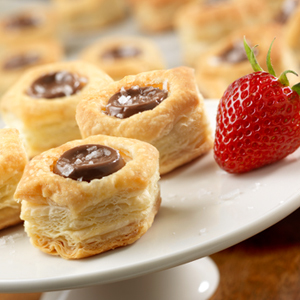 Unfilled baked Puff Pastry Cups may be stored in an airtight container at room temperature for up to 2 days.